Six years have passed since that bolt from the blue: the announcement of Pope Benedict XVI’s papal resignation for reasons of health and old age, writes Andrea Tornielli. Source: Vatican News. After eight years as Pope, Benedict XVI announced on February 11 2013, his intention to resign from the Petrine ministry at the end of that month, because he no longer felt able, physically and spiritually, to carry the weight of that ministry – one that has changed greatly over the past century in the way it is exercised: in terms of celebrations, commitments, and international journeys. Much has been said and written about that papal resignation. The result is that we risk focusing exclusively on the gesture itself, being distracted from the personal testimony and, above all, the magisterium of Pope Benedict XVI. In a few days, the meeting for the protection of minors will take place in the Vatican, with the participation of presidents of bishops’ conferences from around the world, together with Pope Francis. In terms of Pope Benedict’s testimony, it is worthwhile remembering that he was the one who began meeting with victims of abuse. Meetings that always took place far from the cameras, and that involved listening, praying, and tears. Accompanying these meetings were clearer and more decisive rules to combat the terrible plague of abuse. Today there is no doubt that the necessary change of mentality, on the part of bishops and religious superiors first of all, passes through this ability to meet with victims and their families. It requires participating in the pain of their dramatic stories, being aware that this phenomenon can never be fought with norms, codes or best practices alone. 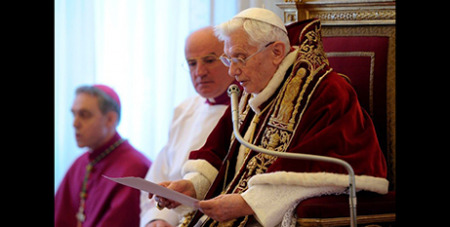 The magisterium of Pope Benedict XVI is all too often trivialised by simplistic interpretations and prefabricated clichés, unable to comprehend the richness, complexity and fidelity to the teachings of Vatican II. How can we fail to remember his insistence that the Church “has nothing of her own to offer to Him who founded her, such that she might say: here is something wonderful that we did! Her raison d’etre consists in being a tool of redemption, in letting herself be saturated by God’s word and in bringing the world into loving unity with God”. – Andrea Tornielli is editorial director of the Dicastery for Communication.